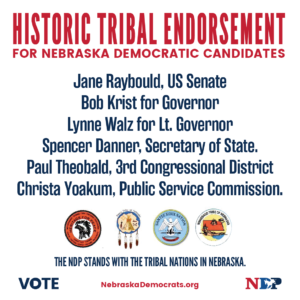 For the first time, Nebraska’s four tribal nations — the Ponca, the Omaha, the Santee Sioux and the Winnebago — have jointly endorsed a slate of Democratic candidates in the Nov. 6 election. Frank LaMere, vice chairman of the NDP and a member of the Winnebago Tribe, praised the endorsement. Chandra Walker, chair of the NDP’s Native Caucus, said she had met with each of the candidates. Said Nebraska Democratic Party Chair Jane Kleeb: “The Nebraska Democratic Party stands with the Tribal Nations in our state. The sovereign rights of Native Americans must be protected. “These historic endorsements of Democratic candidates are humbling and our party is working every day to turn out voters for candidates who stand with the people,” Kleeb said.